I forgot to post this on my site from more than a week ago, but I used the Elixir of the Rapid Mind in a much more efficient way than my first try. I leveled my shadow priest from 97-100 in 9 minutes. Of course, you have to set this up by completing all but one piece of more than several bonus objectives. I have too many alts! So many, I don’t think I’ll get them all up to level 100 by the time Legion drops. But, I’ve discovered a great, but very expensive way to seriously boost your leveling speed. It’s called the “Elixir of the Rapid Mind,” and it is an award from one of the weekly rare garrison missions. What it does is increase experience gain by 300% for 15 min. However, this elixir is not soulbound and can be sold on the auction house…wheeere.. you’ll find it for thousands of gold. I’ve bought three of them so far for 4,500 a pop, which is about the market average. I’m not a wow millionaire, but I did buy three of them to see what it would do, in concert with my 20% potion of accelerated learning and 45% from heirlooms. Of course, all at rested XP! In my three tests, I earned between 3 and 4 million xp per hour, which is about a level every 15 minutes. My latest test was with looting treasures in FrostFire Ridge, with flying, of course, and I did record this session for you all to view on YouTube. Hm..I still have 73 levels to gain across 9 toons to get them all to 100. That’d be 73 potions, or more than 300,000 gold. Welp, this will be short-lived, but fun! 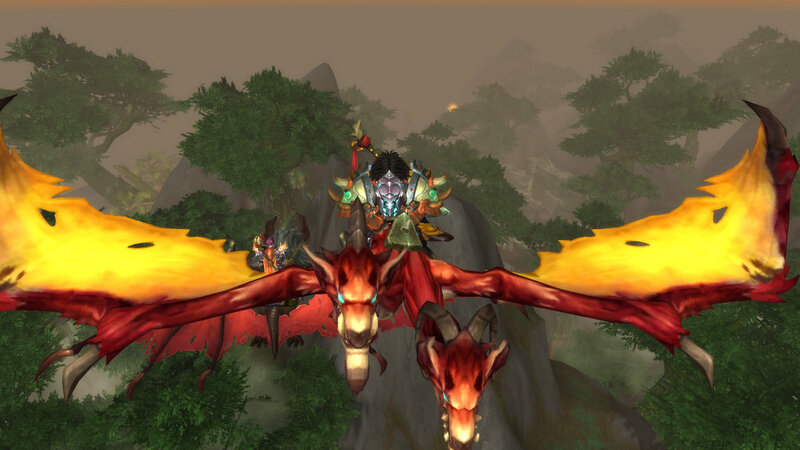 That’s me and my shiny new Skyterror mount FLYING OVER DRAENOR! You can download the segment here, or stream it below! In the recent patch 6.2.2, Blizzard introduced a modification to the achievement “Draenor Pathfinder” that not only gives you a new mount, the Soaring Skyterror, but also gives you the ability to fly in Draenor. It’s really not too tough to get it, and if you’ve had a level 100 character for a while, you probably have quite a bit of this achievement. You’ll need to explore all 6 zones in Draenor, earn the “Loremaster of Draenor” achievement, loot 100 treasures in Draenor (excluding Tanaan jungle), complete the 12 assault bonus objectives in Dreanor, and raise 3 of the new Tanaan reputations to revered. You can check your progress by entering your realm and toon name at wowhead.com/flying. Also the addons Handy Notes and Draenor treasures will guide you to your remaining undiscovered treasures. Of course, your grizzled veteran level 100 toon may not benefit too much from flying, other than being able to easily drop in on treasures and quests in Draenor, but all of your alts also get the ability to fly! In fact, I just used my level 91 priest to zip around from quest to quest in the air, and in a straight line, avoiding mobs and obstacles. Let me tell you, it is amazing how much faster leveling is! Epic Diapers #63: Everything Heirloom is Awesome! My level 90 warrior decked out in glorious golden heirlooms. Yes, he’s fashion conscious. Heirlooms have always been awesome, but now, they’re even more awesome. 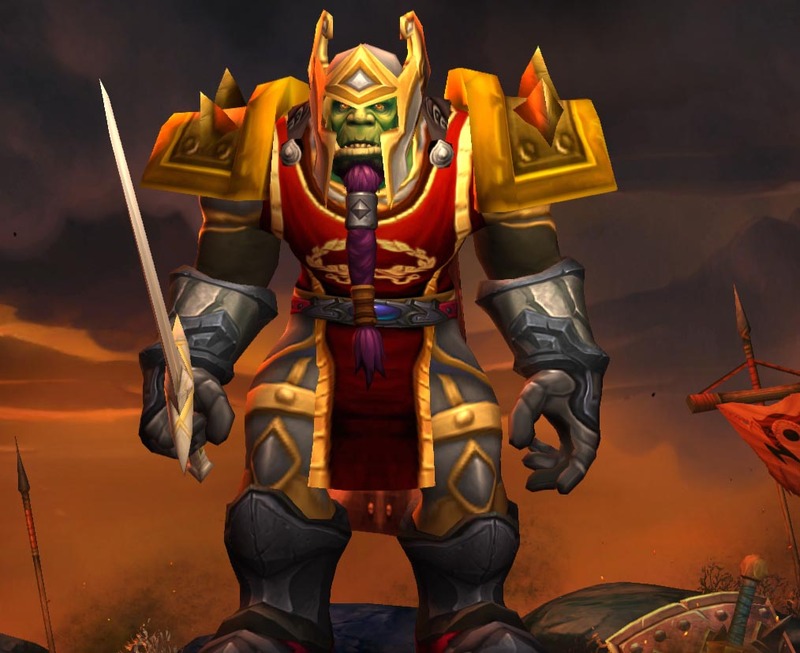 After Blizzard made heirlooms accessible via a tab throughout all your characters, and that you can boost them to carry you to level 100, it offers a great avenue to level your alts all the way to raiding with an efficient route. 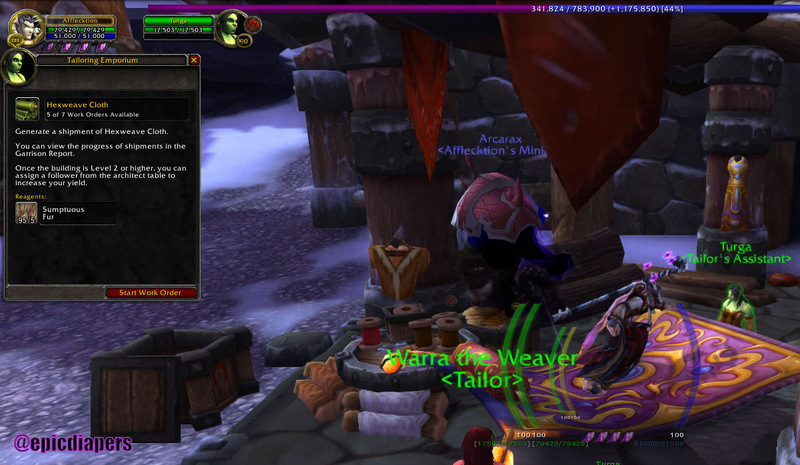 Personally, I have used my heirlooms to get every class to at least level 90. 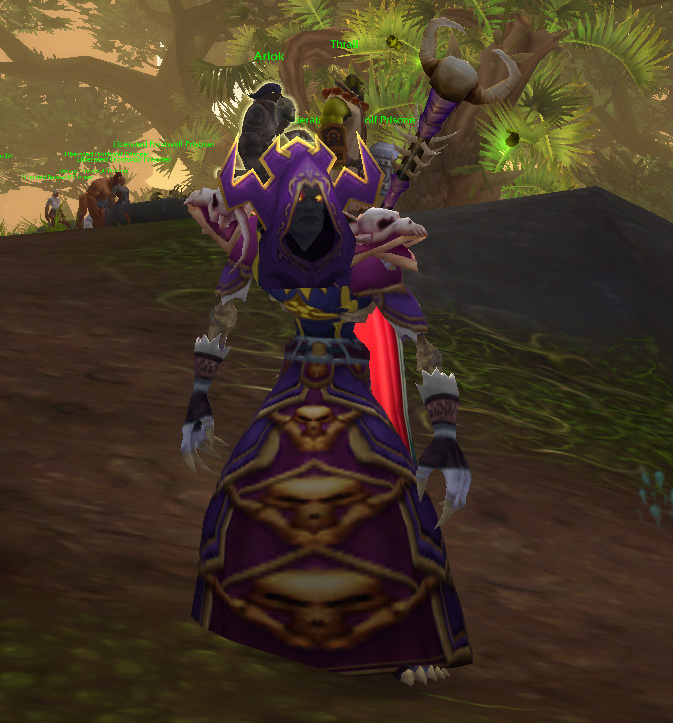 Now, I’ve upgraded my cloth heirlooms to take my mage, priest, druid and shaman to level 100. Yes, you can use cloth heirlooms on druids and shaman that go pew pew, since you take little damage. 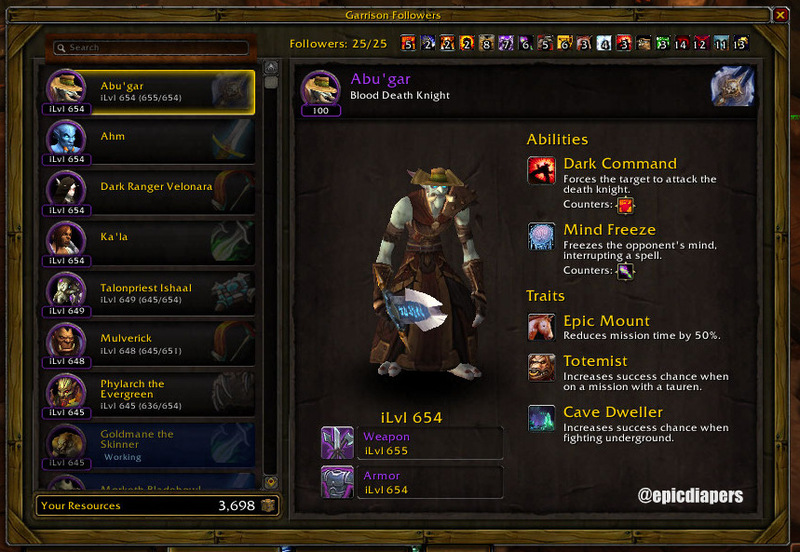 If you combine the 45% leveling experience boost with the 20% garrison potion that’s available at level 91, the grind to 100 is more than 50% faster than my first two toons that I took to level 100. So, plan out your toons by heirloom type, and if you have the gold, upgrade those pieces to get all of your alts to 100. Because, who doesn’t want to run missions and dailies through 11 different classes every day?